The opening session of the eighth Parliament may have seemed like a love fest with exchanges of pleasantries all around except when new MP Udaya Gammanpila was chided. One item that stood out for me is the proposal by the Prime Minister to set up a Parliamentary Research Institute. Such an institute would indeed serve our Parliamentarians and their staff, helping them to push boundaries of knowledge and turning them into students at times. But, are our Parliamentarians ready to use such a service? I believe they are. My late father who ran away from school at a young age was described in an obituary by a group of young men who worked closely with him as “a graduate of the Thakshila of Society”. In the same vein, I consider the 225 Parliamentarians in the seventh Parliament of Sri Lanka as graduates of the Thakshila of the electoral process, whether or not they hold formal qualifications. Unlike graduates from our universities, these graduates have mastered the basics of what it takes to succeed in the vocation they have chosen. They have learned to communicate and much more. They have communicated successfully to their constituencies and only those who got highest approval were elected. In fact, I strongly disagree with those who insist on educational qualifications for Parliamentarians. After going through two or more cycles of elections, our Parliamentarians become graduates indeed. No formal institution can prepare an individual for public life as an election process in a functioning democracy. If we have seen ignorance in our Parliamentarians it is the anti-intellectual culture that was the landmark of the previous regime. Blame the previous leadership, not the individual MPs. What our Parliamentarians need is a good ‘post-graduate’ education opportunity to round out their experiential education. From what I heard at the opening of the eighth Parliament, they might just get that, with new Speaker Karu Jayasuriya as their ‘Dean of Graduate Studies’ and Prime Minister Ranil Wickremesinghe as the visionary. The proposed institute should not be another SLIDA, SLIILG or SLFI, which were established for development administration, local governance and education and training in democracy, respectively, but, suffer from capacity issues. If the proposed Research Institute is to succeed, it should be generously funded and staffed by the best the world has to offer hired through a competitive hiring process. In fact the recruitment process should be an example to our universities and institutes, where the common practice is for existing faculty of low quality to hire those of lower quality so that the new hires are not a threat to them. If all the new hires to the Parliamentary are expatriates, so be it. The Parliament should be the first to understand that we have serious issues of intellectual quality in this country and that we should not be ashamed to seek outside help. We have precedents for such importation of intellect. When Buddha Sasana was endangered in the 17th to 18th centuries due to lack of priests capable of ordaining others, Weliwita Sri Saranankara Thero initiated the import of erudite monks from Thailand, or Siam as the country was known then, to ordain new priests. The new sect so formed functions to date as Siam Nikaya. If the Speaker uses this opportunity to create an exemplary institute, it will not just serve the Parliament, but it will serve as a guiding light for the SLIDA, SLILG and SLFI trio as well. Further it will raise standards of research in Si Lanka, research in humanities and social sciences in particular, to new heights. India and Congressional Research Service (CRS) of USA come to mind as possible models. PRS was founded in 2005 as an independent research initiative. The initiative was incubated in the Centre for Policy Research (CPR), New Delhi, which is a leading Indian think tank recognised by the Central government as a recipient of State funds. With the intellectual and institutional support of CPR, PRS has been able to build and deepen its engagement with legislators, media and citizen groups to strengthen the legislative process. Recently, the initiative has been institutionalised as a not-for-profit Section 25 Company, the Institute for Policy Research Studies. In contrast, the CRS of USA is a part of the Library of Congress which is an agency of the legislative branch of the US Government. One limitation of this arrangement is the inaccessibility of the CRS reports to the general public. CRS memoranda are generated in response to individual member or staff inquiries and are available only to those with access to the congressional intranet. Even the non-confidential publications are not available to the public. Therefore, other independent organisations such as the Federation of American Scientists make CRS reports available as a public service, but, without the seal of approval of the CRS. In terms of expertise, the proposed research institute does need to have expertise in all the areas, but, they should be staffed by a sufficient number with expertise to cover interdisciplinary areas covered by Parliamentary committees. Take the case of electoral reforms. The Dinesh Gunawardena Committee deliberated for years with the assistance of volunteers. As a result, the report of the committee is a lean document containing the proposals, but, little content supporting the proposals. In contrast, the 1943 Report of the Special Committee on Education in the State Council of Ceylon, or the CWW Kannangara report as it is popularly known, is a comprehensive document with data, foot notes and in-depth analysis worthy of a PhD dissertation. The technical support for the Committee has been provided by the officials at the Ministry of Education. In the proposed PRS too, the researchers can draw upon the practical knowledge of ministries, the central bank and other state institutions, but, a dedicated research staff should be there to support the MPs. 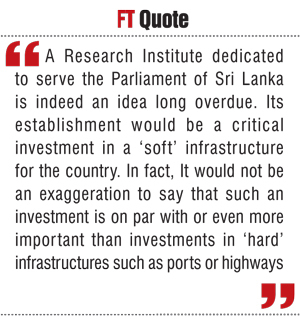 A Research Institute dedicated to serve the Parliament of Sri Lanka is indeed an idea long overdue. Its establishment would be a critical investment in a ‘soft’ infrastructure for the country. In fact, It would not be an exaggeration to say that such an investment is on par with or even more important than investments in ‘hard’ infrastructures such as ports or highways.